UD researcher Chad Forbes is studying why fewer women are in STEM fields and how to change that. 1:38 p.m., Oct. 15, 2013--Call it a self-fulfilling prophecy. Women who are the most invested in science, technology, engineering and mathematics fields (STEM) are also the ones who are most likely to leave them. Part of it may have to do with a well-studied phenomenon called stereotype threat. But the University of Delaware’s Chad Forbes is trying to help change that. 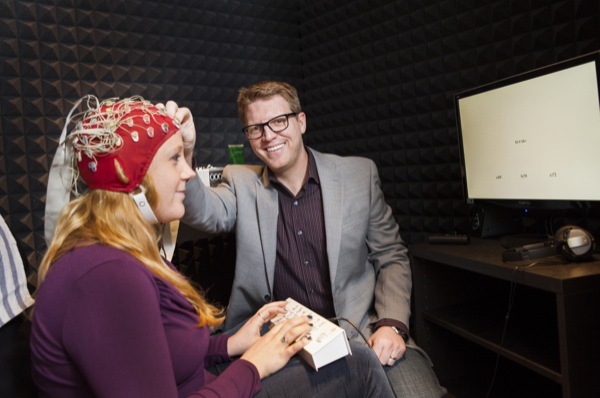 The assistant professor of psychology was recently awarded a multi-year, $791,000 grant from the National Science Foundation (NSF) to continue work he’s been passionate about since childhood. Only a third of doctoral degrees in STEM are awarded to women, and just 25 percent of STEM positions are occupied by females. Those in them are more likely than men to report job dissatisfaction. “It’s a complex problem and there are no easy answers,” Forbes explained. Combining neuroscience with social psychology, he’s trying to understand how stereotype threat impacts women and minorities, why they leave STEM fields and how that trend can be reversed. For many females, they encounter this stereotype in the world and often reflect upon it during stressful, anxiety-ridden situations, like when taking a test or giving a presentation. These “situational stressors” can become a detriment to their performance, inadvertently reinforcing for a woman that she, like other women, is not good at math. Her brain processes that information and stores it, only to have it come back up again the next time she’s in the academic hot seat. Something as simple as having a female mark her gender before a diagnostic math test can lower her score. It may set into motion the stereotype threat phenomenon, bringing forth all the negative experiences and emotions she has stored away from previous situations in STEM. Have her mark it after the test, and her scores are on par with males, said Forbes, recently called a “Rising Star” by the American Psychological Association. Studies in his lab show that women overwhelmingly remember negative feedback in STEM over positive. In his studies, women took a diagnostic math test on a computer, in which the font providing them feedback on their incorrect answers was different from the font used on feedback for their correct ones. The women remembered the “wrong answer” font in a memory test a week later much better than the “right answer” font. The effect was strongest in the women who answered in a survey that math was important to their identity. This laid the foundation for his current NSF-funded work in which he is trying to answer questions like: Do women who highly value STEM process stereotype threat situations differently? Do learned aversions interfere with a woman’s ability to positively identify with STEM? Can we teach women how to avoid these effects? Forbes will rely on many of the same techniques he has used in the past, but will also be looking at different genetic markers and activity in particular regions of women’s brains in order to delve deeper. He wants to know how different parts of the brain are talking to each other and whether some women are better at shutting off or tuning out the negativity than others. Because clearly, the stereotype that women aren’t good at math just can’t be true. “Lots of women make it,” Forbes said.